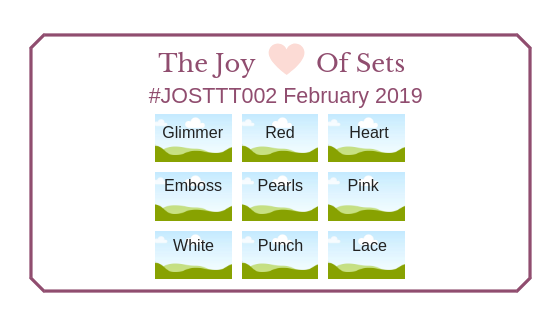 Today is the Second Challenge over at The Joy of Sets Tic Tac Toe Challenge! I am thoroughly enjoying being a Design Team Member with this talented bunch of crafters from around the world! We are all members of the The Joy of Sets Facebook Group that is full of stampers sharing cards created with current and retired Stampin' Up!® stamp sets as well as stamp sets from other companies. For this month's challenge designed by Andrea Parr from England, you can select any three of the design elements in a row on the board going in a horizontal, vertical or diagonal direction. I have chosen the center horizontal elements of Emboss, Pearls and Pink! I had a really tough time deciding which elements this card would fall as it could also be White, Pearls, Heart or even Heart, Pink, Lace! I used textured embossing with the Lace Dynamic Textured Impressions Embossing Folder and heat embossing with White Stampin' Emboss Powder on Vellum Cardstock. Heat embossing on the vellum allowed me to apply Stampin' Blends to the reverse side of the images for the perfect colors. The embossed stitching from the Rectangle Stitched Framelits Dies is an extra bonus, don't you think?! The pink is one of the current 2019-2020 In Colors Lovely Lipstick! It just pops against the white with the Swirly Frames and in the heat embossed Ribbon of Courage heart. And the lover of pearls that I am just couldn't let this challenge pass without picking them as an element... Pearl Basic Jewels were the perfect addition for the flower centers within the heart and as a little extra touch to the sentiment. I hope that today's project has inspired you to participate in The Joy of Sets Tic Tac Toe Challenge, #JOSTTT002. Please be sure to pop over to receive more inspiration from the other design team members and I look forward to seeing your entry (entries) on the blog! If so, be sure to pop back by to see some additional inspiration using these same supplies! Angie this is gorgeous - I love the colouring on that heart - it's a technique I haven't used in a while - how do you find the stamping blends? Do I need them? How beautiful is this Angie? I absolutely love it. It's so intricate and delicate yet comes across as totally unfussy. Just love it. Embossing on your vellum was a fantastic idea. It looks so elegant!